comBOX services utilize worldwide Data Centers with optimized global routing, meeting the communication needs of company branches located in Europe, the Middle East, the Americas and Asia. Do you need a unified solution for the Internet and VPN needs of both your offices and Fleet? Do you want to optimize international congested network paths? Shipping companies, maintain offices in various countries across the globe while they operate a fleet of Vessels. All these company’s facilities require a flexible, professional and cost effective solution for both Internet and VPN access. The available comBOX service bundles can offer your company a unified solution through the bonding of multiple connections available at each facility, while optimizing International paths, via our ultrafast international backbone cloud infrastructure. With comBOX service bundles, your company can adopt and take advantage of modern business solutions, while reducing costs; such as VoIP telephony, and Cloud applications, which in order to be applied in the daily operations, it is absolutely necessary to ensure the reliability and high-performance of your business’ WAN. 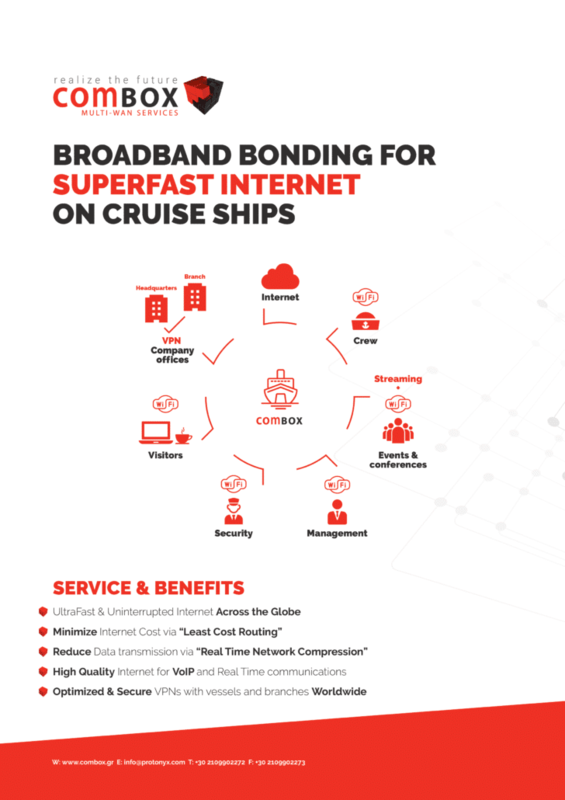 Combine multiple Satellite links of your choice or even combine the available Satellite links with multiple low cost 3G/4G connections to create ultra-high speed connections for the increased Internet needs of your vessels.